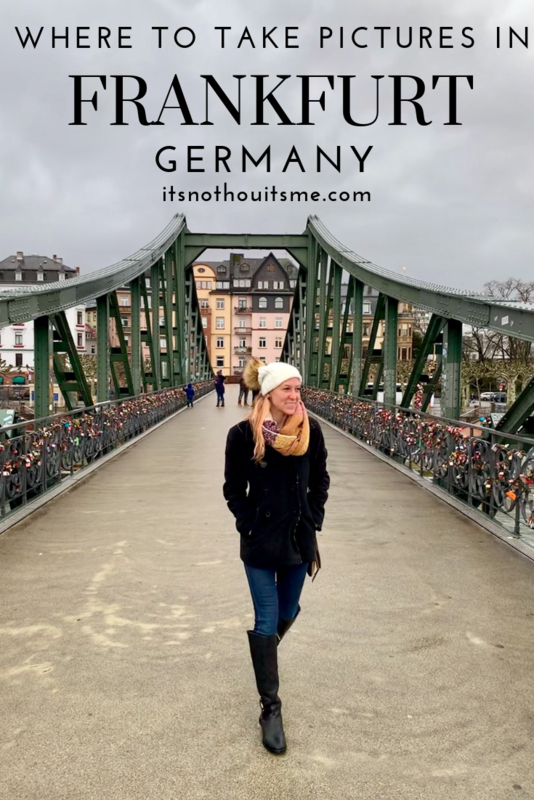 My boyfriend recently moved to Frankfurt, so naturally I had to take a trip over the pond to visit him and explore his new hometown. 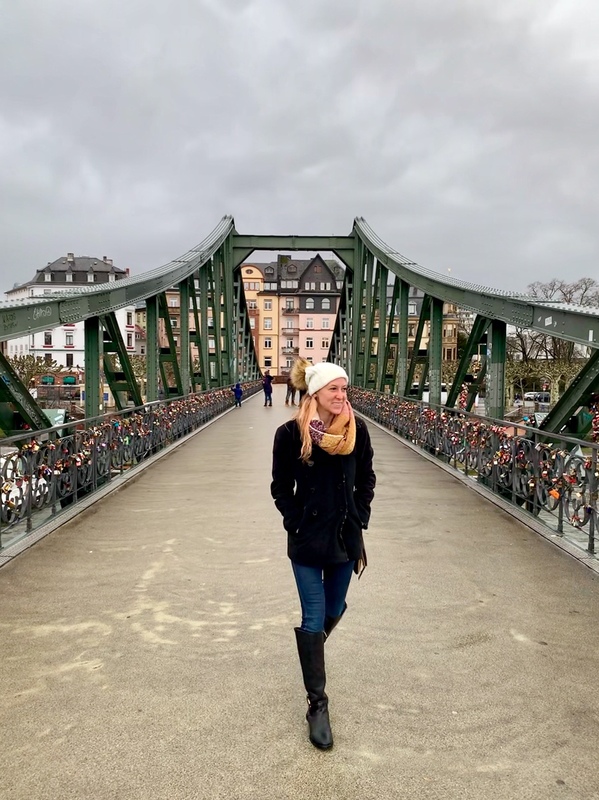 Adventuring with a pseudo-local opened my eyes to all the adventures Frankfurt has to offer. 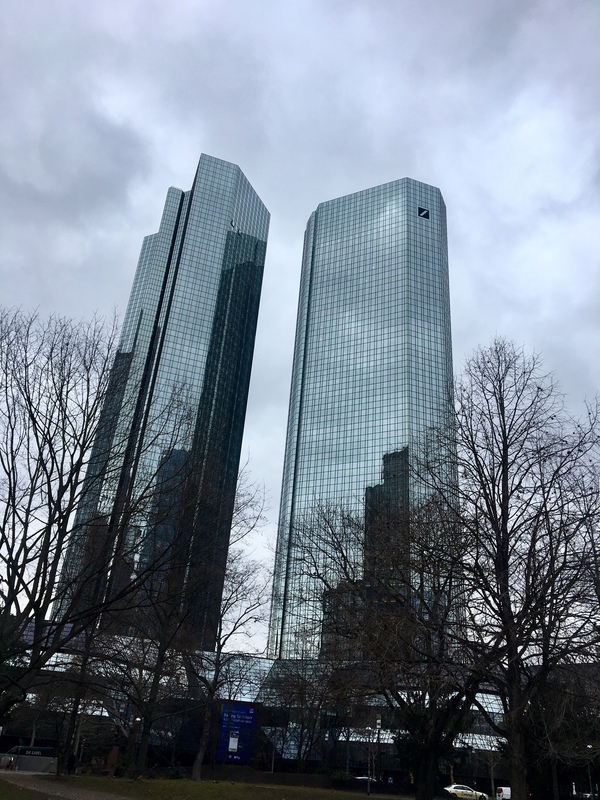 I think most people (myself included) had the perception that Frankfurt is a super business oriented town with little for visitors to do. Some might say the same thing about Houston, but lawd knows we prove those people wrong once they visit, so I was open to Frankfurt doing the same for me! 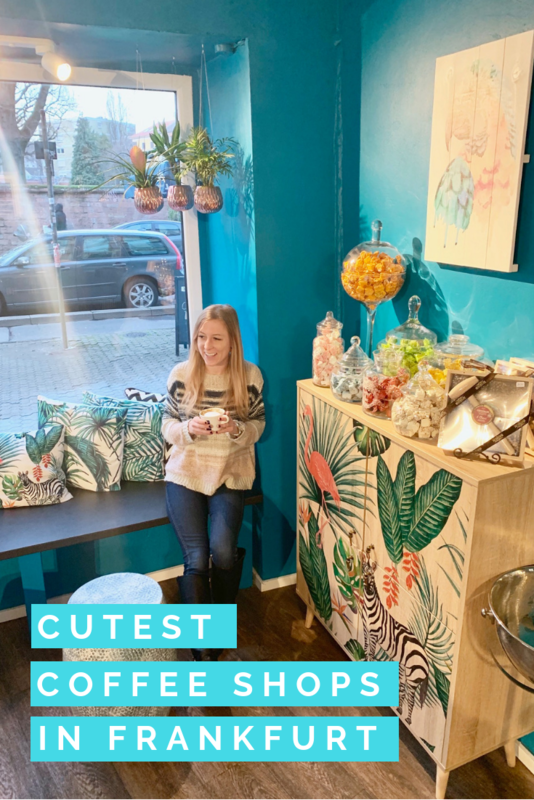 I spent about a week in the city exploring the historic sites, visiting museums, reading in coffee shops and immersing myself in local life. 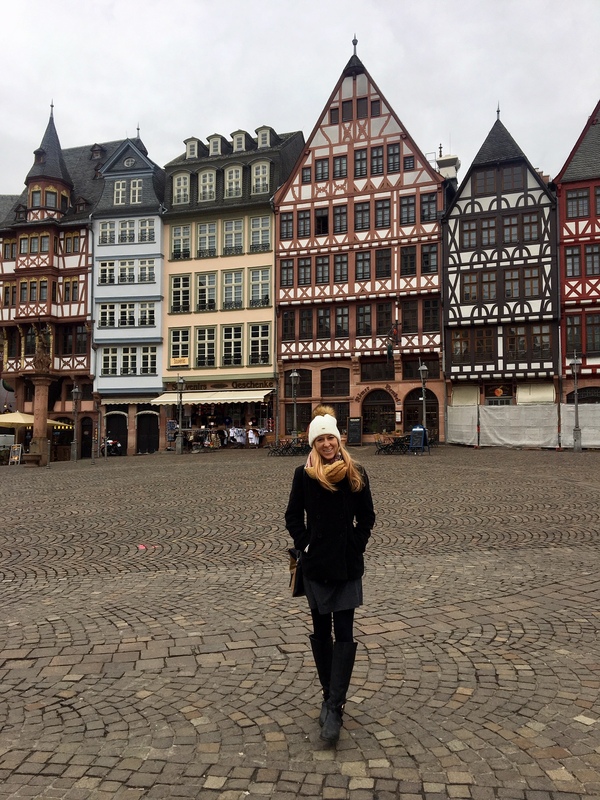 Frankfurt offered PLENTY for me to fill my time in the city, and the more time I spent there, the more I realized how much I hadn’t seen! 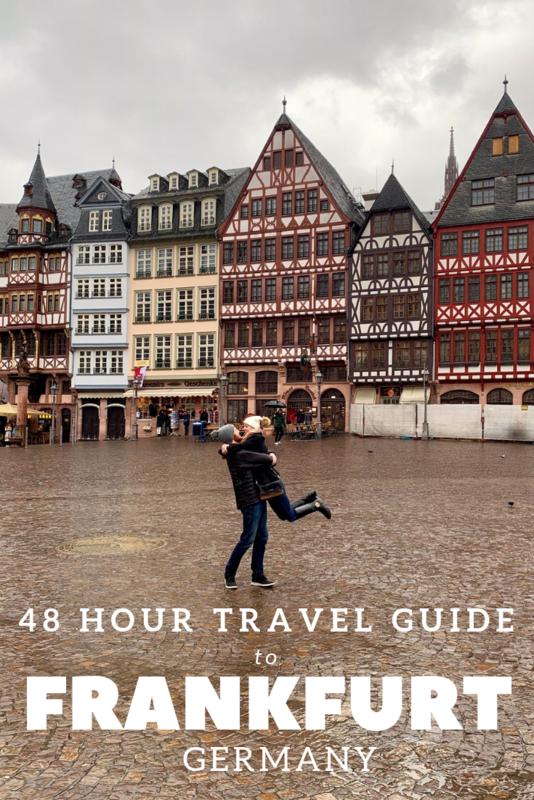 If I were limited in my visit to Frankfurt, here’s how I would spend 48 hours in the city. Known as the finance capital of Europe, Frankfurt is located in Western Germany and is full history and culture, as well as bankers. I always like to spend my first day in any city understanding it’s history and getting my bearings. The full name of the city is actually “Frankfurt am Main” as it’s nestled into the curve of the Main River. For a nice walk or jog, head to the Nizza Garten. Cleanly paved trails stretch from Honsellstrasse to the Marina Westhafen. Depending on how far you want to go, you can cut your run short by crossing over one of the many bridges. The full loop is about 5 miles and is well populated throughout the day with runners, people pushing baby carriages, tourists and business people stopping outside for a break. 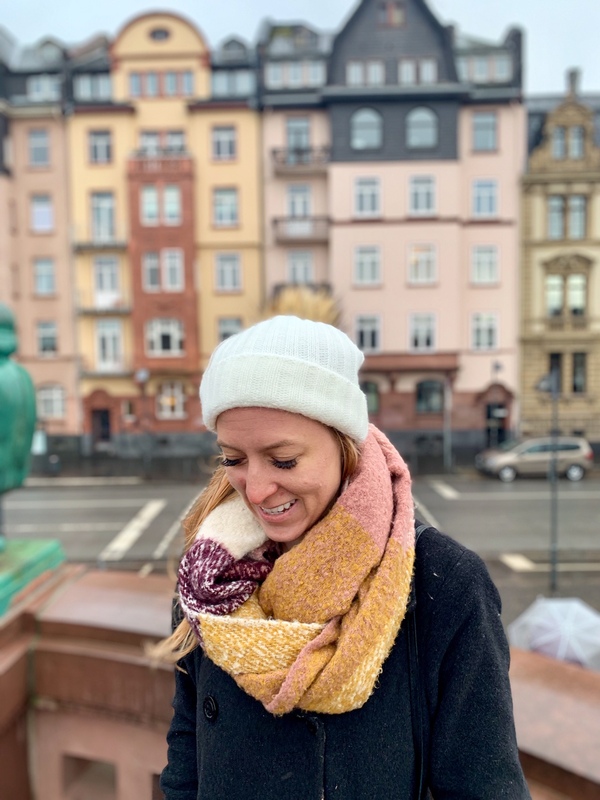 The first thing I like to do in any city is take a walking tour to understand the lay of the land, get my bearings, check off some touristy attractions, connect with other travelers (especially when traveling alone! ), and get recommendations from the local tour guides. The tour I selected (already pre-vetted by my boyfriend) was the Frankfurt Alternative Free Walking Tour. It meets every day at 10am and 2pm at the Haufbanhof (central train station). Outside the Haufbanhof across from the Gold-Exchange, a compilation of food stalls is set up vending hot coffee, bread, sandwiches and meats, which would be a quick easy breakfast should you need it. The tour started at the Red Light District near the train station and the guide told the story of how prostitution is legal and regulated and how there are safe houses run by social workers for people to take drugs in a sanitary way as well as offering help for people who want it. While a little sketch, the Red Light District manages to keep most homeless people contained to that area and off the streets. We then walked to the Wallanlagen green ring park which forms a semi-circle around old Frankfurt and used to be the location of the old city wall. Sprinkled throughout the park are reminders of the finance giants that run the city like the giant Euro sign, the parallel towers of Deutsche Bank dubbed “Credit” and “Debit”, as well as the Bull and Bear statues outside the Frankfurt stock exchange (known as the “Cathedral for Capitalists”). I heard the stories of how most of Frankfurt was bombed and flattened during World War II—except for the Kaiserdom Saint Batheolomaus cathedral which served as a landmark for the bombers. We went inside Paulskirche where the separate Germanic tribes agreed to form one state back in the 1849. 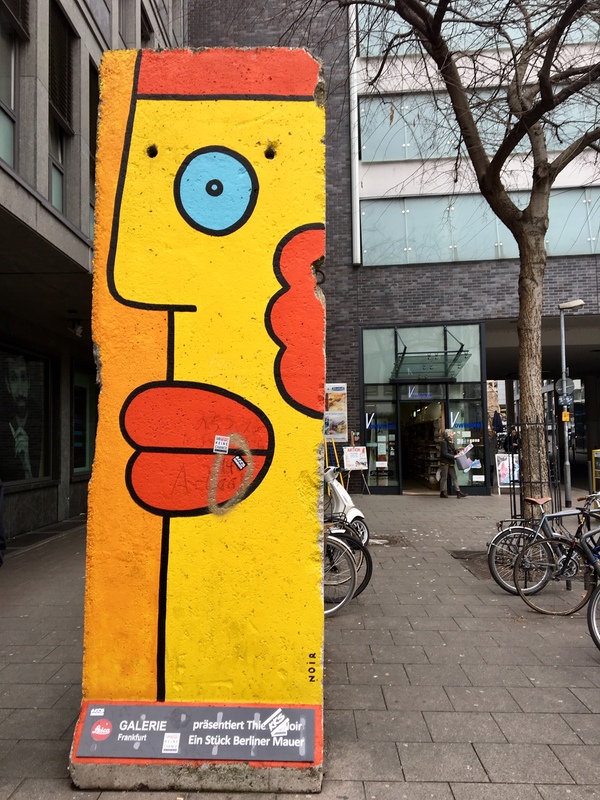 We saw a section of the Berlin Wall, Goethe’s house and heard the story of the tripping stones art project. 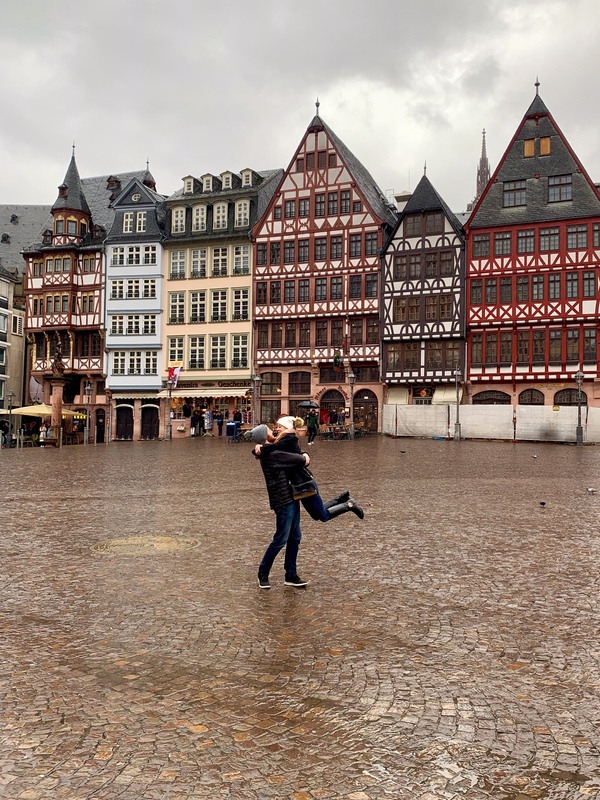 The tour concluded at the Römerberg plaza, which looks old and is definitely one of the most photographed spots in Frankfurt with the traditional Rathaus and German architecture (even though everything is actually new and rebuilt after WW2). The Alternative Free Walking tour took about 2.5 hours and was free! I just tipped at the end. 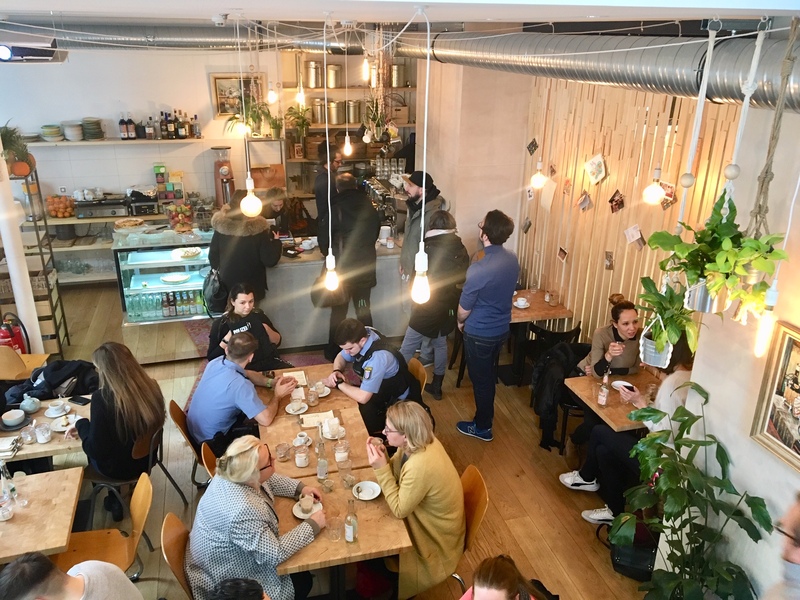 For lunch, I had flagged a bunch of coffee shops, cafes and vegan eateries around the Zeil (main shopping district) and dined at quite a few during my time in Frankfurt. My favorites were Beet Root and Vevay for lunch (both delicious vegan food!! 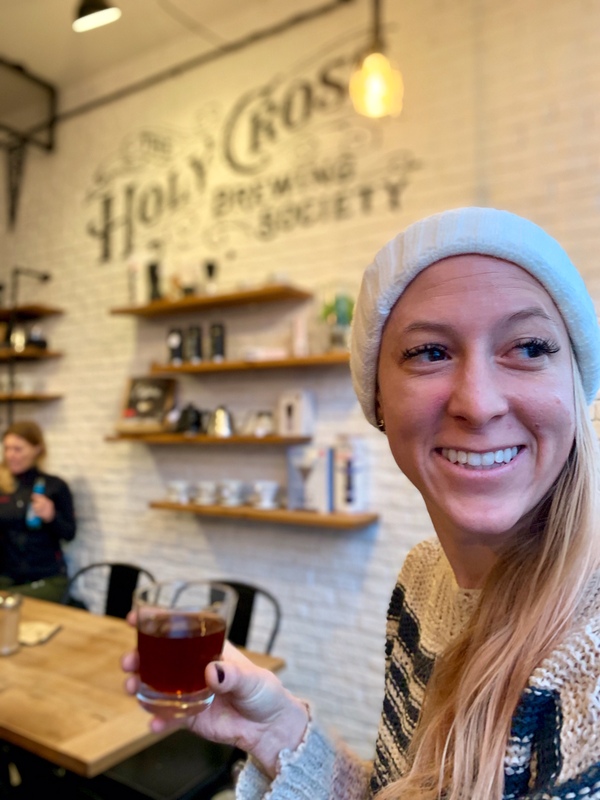 ), and Holy Cross Brewing Society, Bohnerie and Mellow Yellow Cafe for coffee and pastries. Pro tip: treat coffee shops like you would a bar in America. Order at the counter, take a seat, and then pay your tab at the end. The Zeil is packed with shops, brand name stores and tourist shops. The Galeria Kaufhof offers great views of the city if you climb to the top, as do viewing deck on the Main Tower. I picked up a small Bembel pitcher as a souvenir at Topferei Bauer. 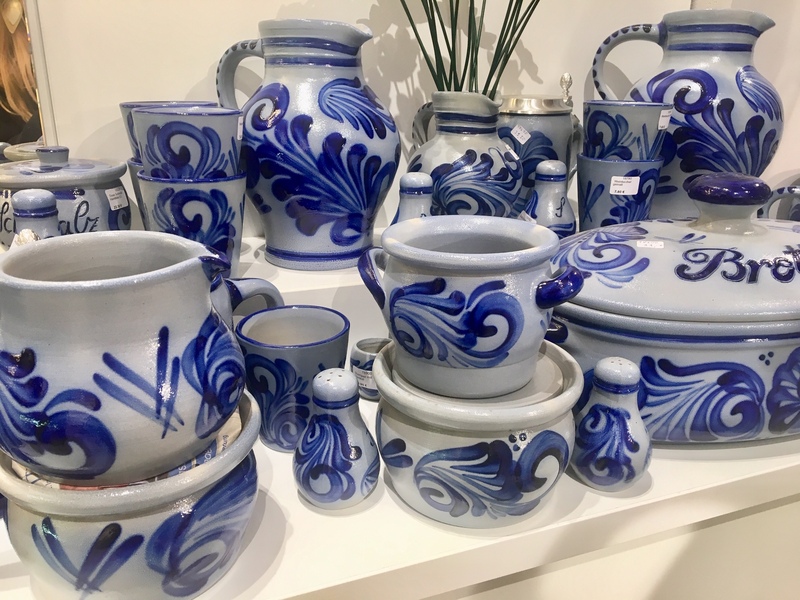 Bembel is the traditional pottery and design of Frankfurt used to serve apfelwein (aka apple wine). Here’s a good list of authentic souvenir shops. Note: Getting around Frankfurt was pretty easy with a day-pass on the U-Bahn which costs €5.25. However, if you’re caught without a ticket you can be charged up to €60 on the spot. For dinner, we had reservations for our anniversary at the legendary Seven Swans restaurant. I was beyond stoked about this spot because it has a Michelin Star (my first visit to a Michelin restaurant!!!) AND is entirely vegetarian. I was basically in heaven. 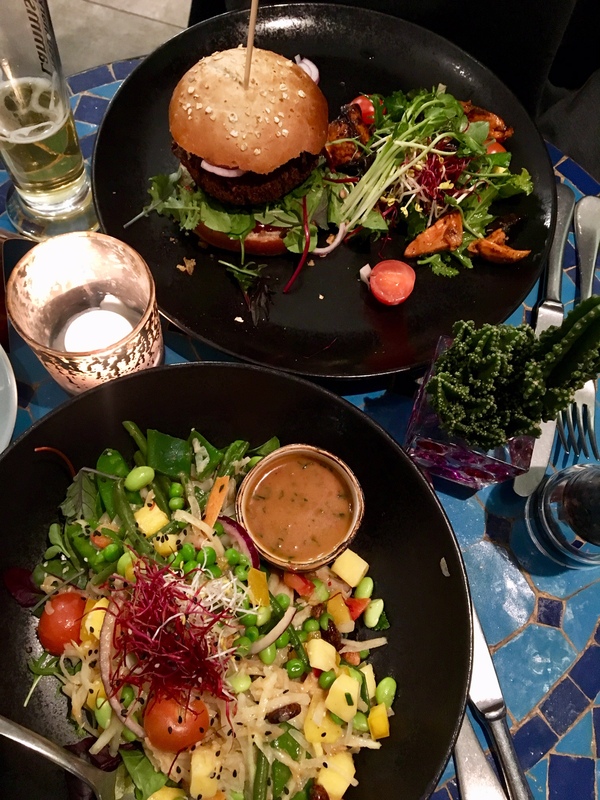 Vegetarian or not, Seven Swans will exceed any foodie’s dining expectations! It’s nestled in this tiny building no larger than 10 feet wide overlooking the river. The first floor has a bar that fit no more than ten people where we enjoyed a vermouth cocktail aperitif. At 7pm we were seated for our reservation on the fourth floor. Our table had a ceramic bowl filled with flower petals and herbs from the region, and a server poured warm water into it for us to cleanse our hands. Then the menu came which was a six-course tasting menu with bread (of course), a radish starter plate, and a surprise fruit palate cleanser in the middle. The dinner took nearly 4 hours and we were stuffed by the end. Each course was impeccably crafted with layers of flavor, texture, plating and performance as the server would pour broth or sauce into a dish or bring out a plate with a still flaming pine branch. Reminding me of excellent meals I’ve had at One Fifth and Oxheart in Houston and Puripecha in Dallas, I was over the moon with the Seven Swans attention to detail. It was a lovely place to celebrate our anniversary and try the finest of cuisines in Frankfurt. 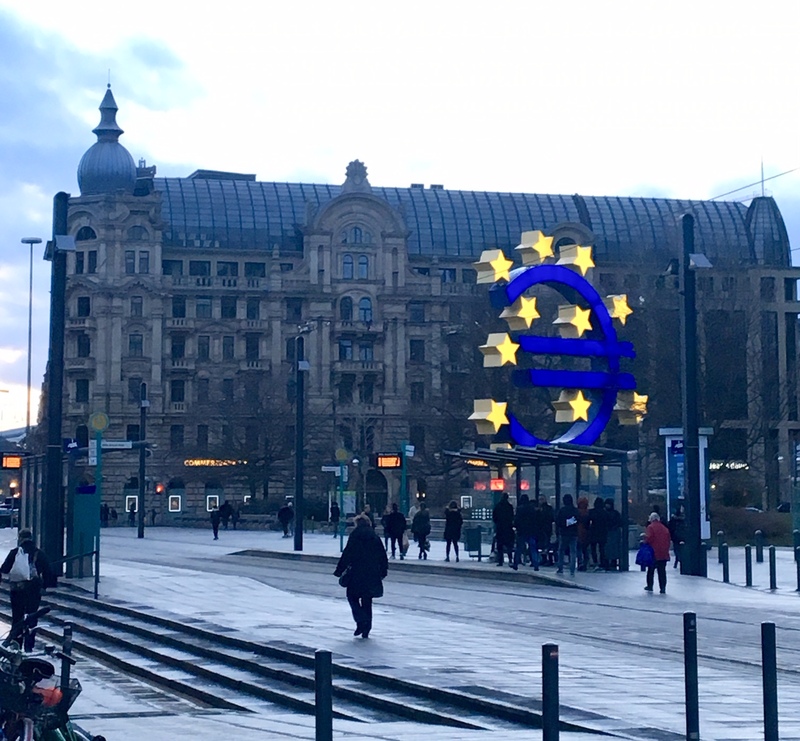 By writing this blog post, I hope to dispel some of the myths that Frankfurt is a dry-business-centric city. I found the city to be vibrant, full of life, lots of great food, and even artistic endeavors. Grab breakfast at Metropol Cafe Am Dom! 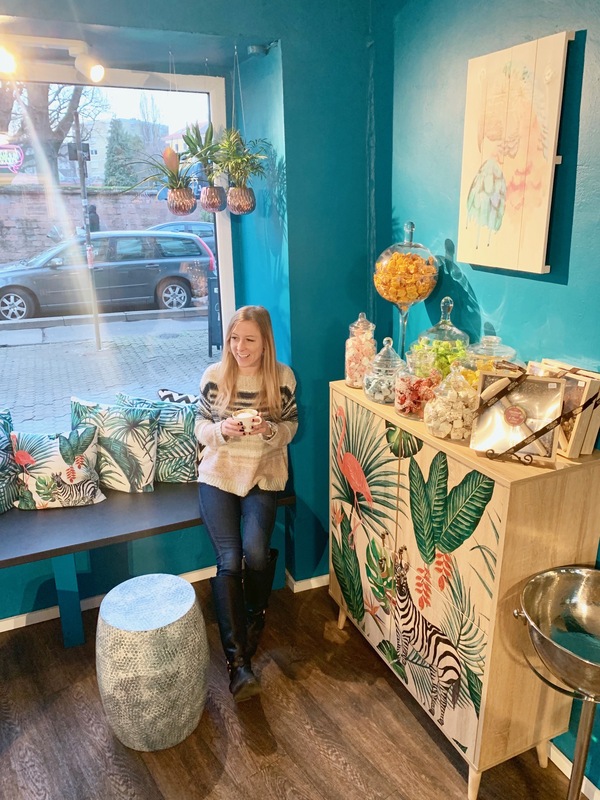 It’s a lovely cafe locate a few blocks away from the Römerberg city center and offers a menu filled with hearty, homemade options. We seated ourselves and shared a table with a few other couples for Sunday morning brunch. 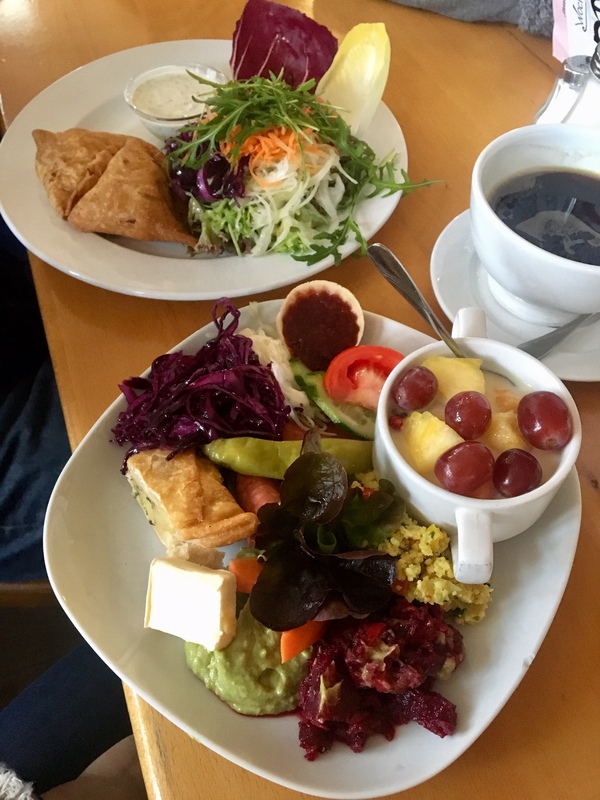 I ordered the vegan breakfast which came with a samosa, muesli, AND two types of sauerkraut (so German). My boyfriend got a Indian inspired samosa. We both enjoyed our meals greatly. After breakfast we wandered to the MMK Museum of Modern Art and saw an interesting exhibit by American artist Cady Nolan that contrasted violence with celebrities and barriers. The exhibits rotate every few months, so definitely fun to check back to see what’s new. 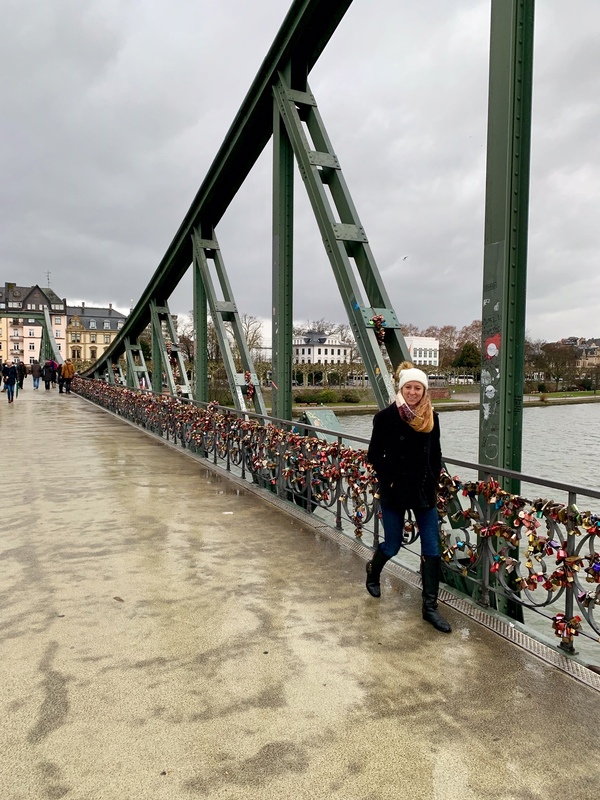 We then stopped into the Kaiserdom Saint Batheolomaus before wandering to the other side of the river (pictures on the Eiserner Steg lock bridge were necessary), where the rest of the museums were located. 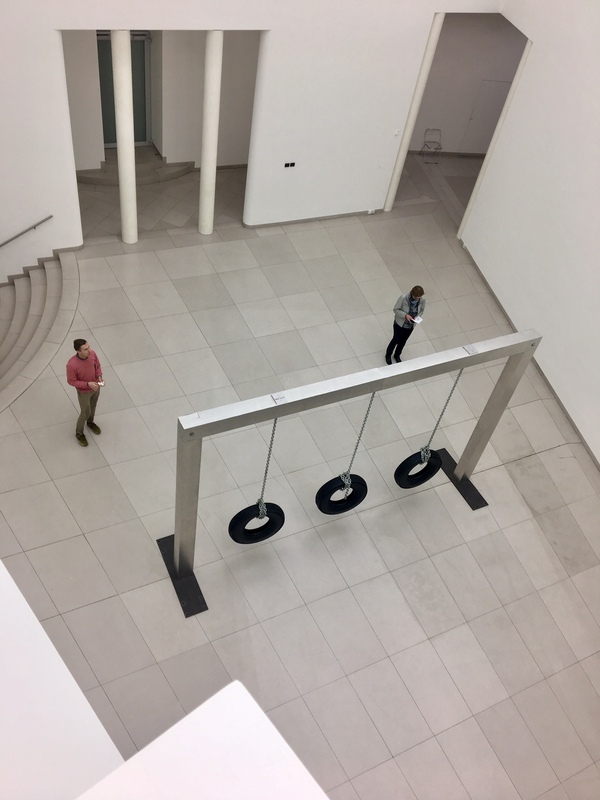 Obviously, you have to pick and choose which museums you visit but depending on your interest Frankfurt offers many world class collections–here’s a list! As Frankfurt is such a business centric city, one of the largest attractions is relaxation and spas. 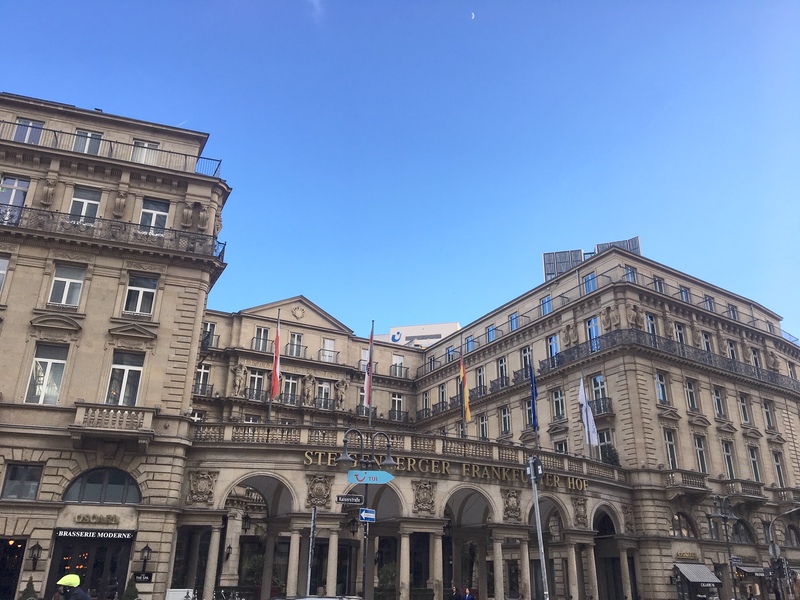 My boyfriend gifted me a massage at the SPA of the Steigenberger for our anniversary and I was so stoked to experience the German spa approach. The Steigenberger is an elegant af hotel who’s room pricing is likely way outside my budget, but the massage at €109 (no tipping in Europe!) is pretty on par with prices in Houston—but the amenities were over the top. Highly recommend making an appointment here and spending the afternoon relaxing (after all you just ran/walked all over the city for two days!). Per the instructions on the spa locker room, it’s ideal to visit the sauna before heading to the massage to ensure the benefits are fully realized. The Steigenberger Spa has a coed dry sauna, steam room, showers and relaxation room as well as gender specific steam room, showers and locker area. To sauna properly, you warm your body up in the shower, drop off and then head to the sauna for 10-15 minutes. I stuck to the dry sauna to protect my lashes (thanks Chic Lash Boutique for the beautiful set!) and alternated between sweating on the dry planks and cooling down on the stone recliners in the relaxation room. Let me tell you it was a little bizarre sharing a sauna with naked Europeans (both men and women). This isn’t conservative Protestant America— they’re all about walking around naked under robes and not. After the sauna routine which takes about an hour (bring a book or newspaper to enjoy in the locker room), you’re to head to your massage. I pretty much fell asleep with the relaxing music and left totally refreshed and read to take on the world’s most intense executive leadership meeting early dinner. After you’re warmed up from the cold (I went in blustery February), head back out to the River Main for some spectacular skyline views. 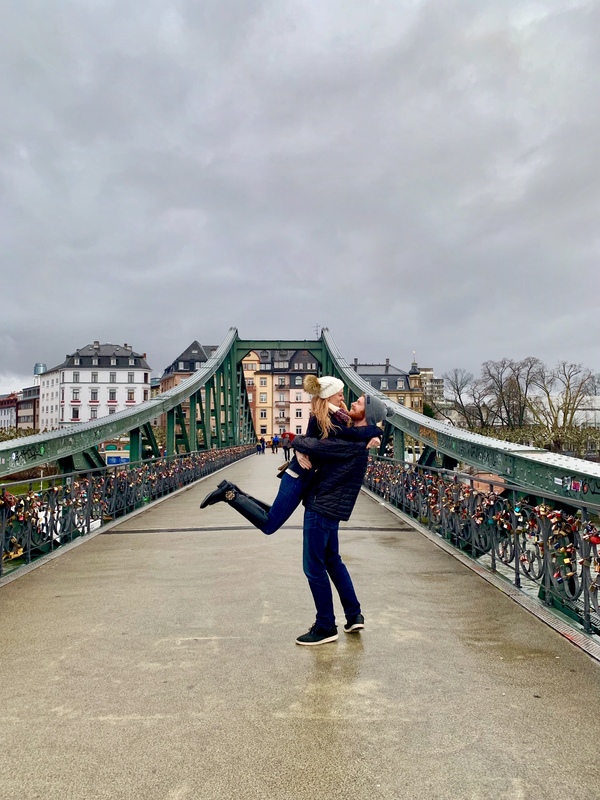 The Eiserner Steg bridge is known for lovers and covered with locks. 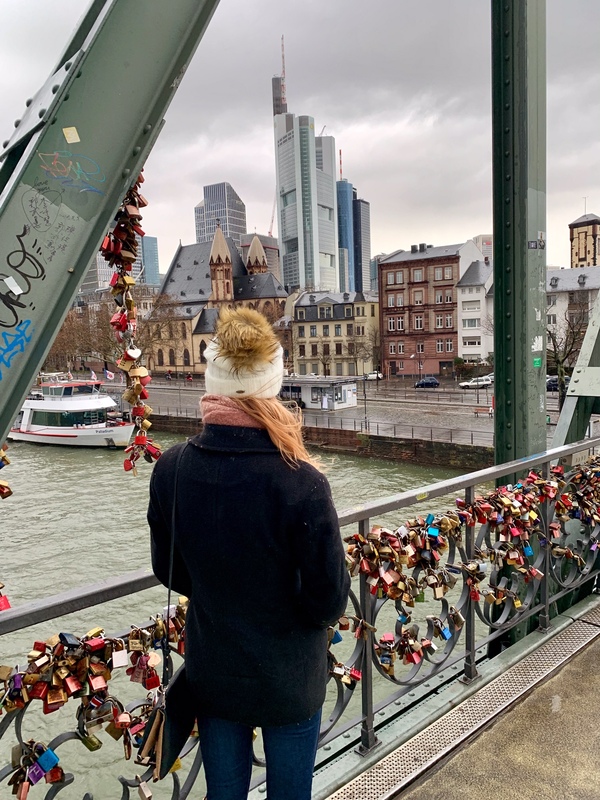 The Alte Brücke bridge prices lovely views of the city, and Untermainbrücke connects you with the Sachsenhausen neighborhood which is full of typical Frankfurt fare and local restaurants! Sachsenhausen is a must visit to see an apfelwein bar and try the local Frankfurt cuisine. We passed many cute ones along the way, but ultimately landed on going to Adolf Wagner. Around 4:30pm, it was full of locals and the wood paneling and decor reminded me much of the beer halls of Munich, but instead of beer the drink of choice was apfelwein. If you’re going around dinner time, make sure you had a reservation as most places fill up by 6pm or 7pm. Seated at our table we split an order of händkase mit musik (handshake with music) and the famous green sauce. The händkase is smelly cheese accompanied by onions and crusty bread. It’s called “with music” because you allegedly fart afterwards. I found the dish to be pretty decent (maybe the buzz from the apfelwein helped), and didn’t experience any aftereffects. Urban legend perhaps? The green sauce included potatoes and hard boiled eggs. The green sauce is prepare with sour cream and 7 herbs from the region, which depending on the season include Borage, Chervil, Garden Cress, Parsley, Salad Burnet, Sorrel and Chives. I liked the sauce the best. Although as the locals say, one glass of aphelwein tastes good (tastes like alcoholic apple juice), two taste great, and by glass number three you’ll fall in love. Next time, I’ll get a full Bembel pitcher full and test out that theory. 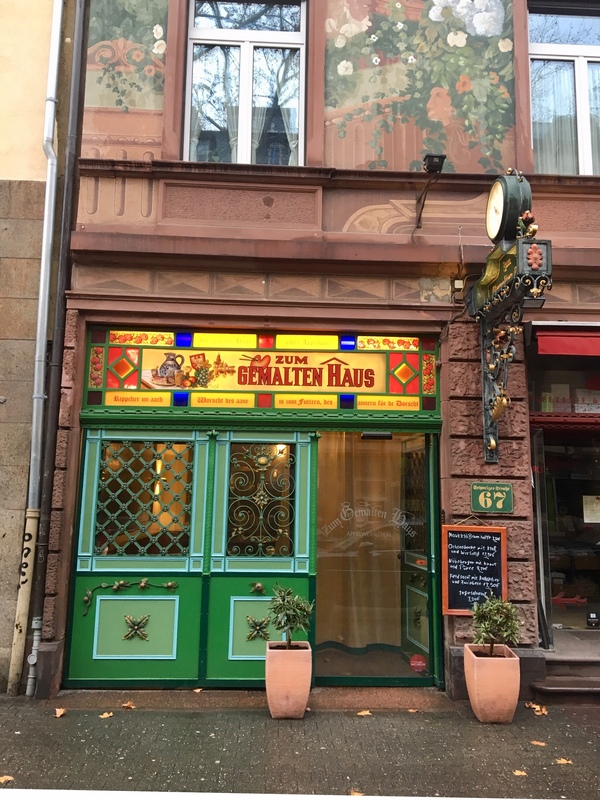 To enjoy the culinary and cultural arts of Frankfurt there are many options. We decided to have date night at the Frankfurt Opera to see the show La Forza del Destino. 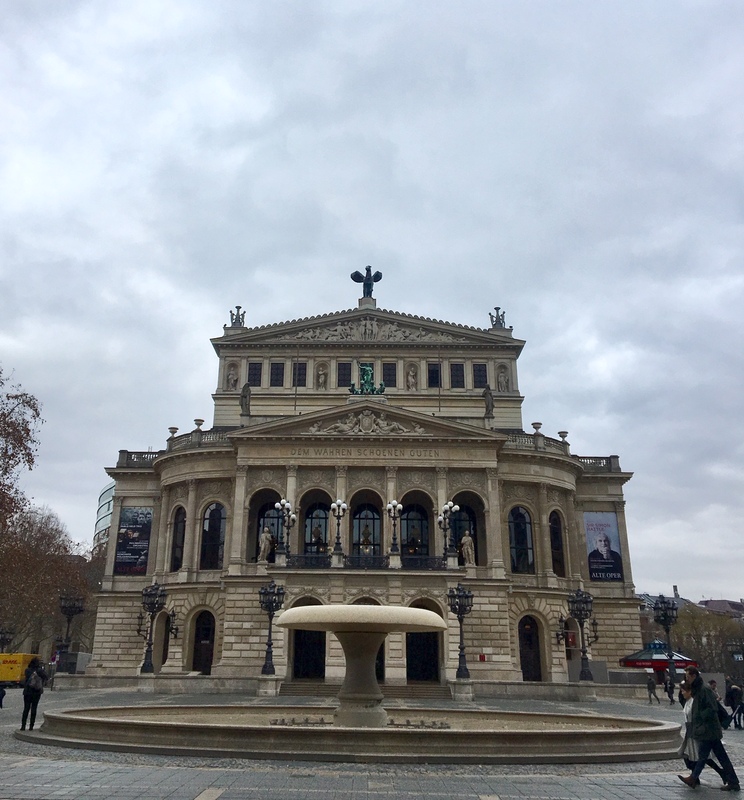 The performance took place in Oper Frankfurt (not to be confused with the Alte Oper (Old Opera) house a few blocks away which is used for other events). This show was the second Opera I’ve ever seen (the first was in Hamburg). It started at 7pm and had a long intermission in which ever German grabbed a drink and even dined in a full dinner. The play originally set in the 1700s was a bit dark with heavy political themes as the director reinterpreted it for modern times that highlighted the history of racism in the US. The Opera was sung in Italian and had German and English subtitles so it was easy to follow along. Despite the tragic plot (very Shakespearean in the sense that everyone died), the show was impeccably done and a wonderful experience. The performance schedule changes depending on the night so there’s always something fun to see! After the show, we weren’t ready to go home so we headed for drinks at Eschersheimer Turm. This tower is a former entrance of Frankfurt dating back to the 1300s. Enjoy a local beer on tap and some pommes frites (aka thick European French fries served with mayo) to round out the night. Sauchsenhausen is also a good young neighborhood with lots of bars and nightlife if you’re looking to go out. Despite being known as a business hub, I found Frankfurt to be a lovely place to spend the week. With direct flights on United from Houston, it’s also an excellent launching point to other European cities. I personally used the train hub to launch into other adventures in Switzerland! 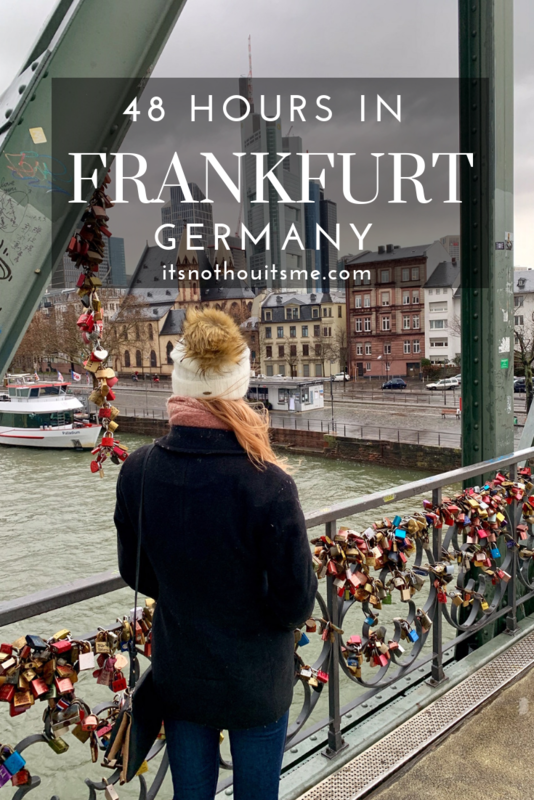 Have you been to Frankfurt? What are your thoughts on this Germany city? Leave your questions and thoughts in the comments section below! 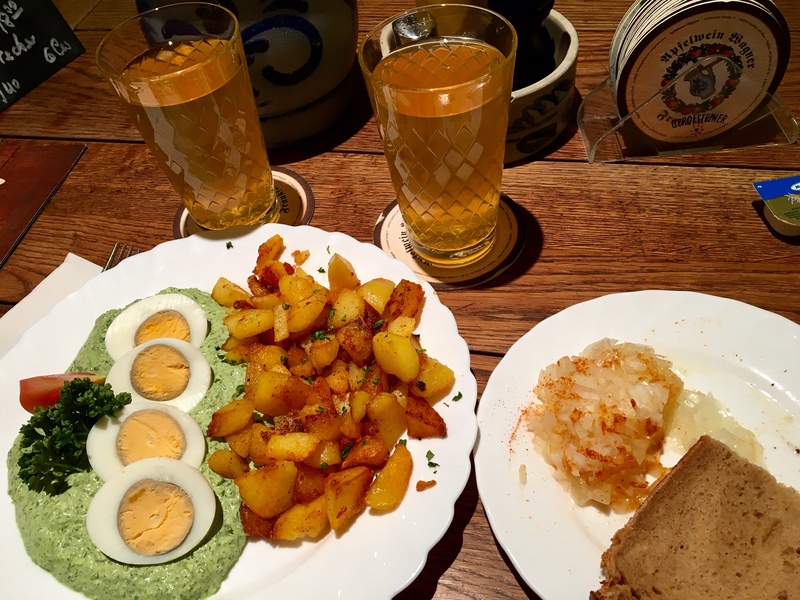 Tags: apfelwein, Frankfurt, Germany, green sauce. Bookmark the permalink.